Personalized glamour glitter sunglasses are becoming the norm of the party because people cannot get enough of it. These sunglasses are largely favored as a wedding favor gift, birthday party token and it aids in peaking the joyousness. This custom glamour glitter sunglasses can be individually handed out the guests or customers at the right time and people are going to be happy on seeking it. We have devised value saving plans for the benefit of those who are seeking these sunglasses for mass distribution purposes or those who wish to spread joyous spirits all around. 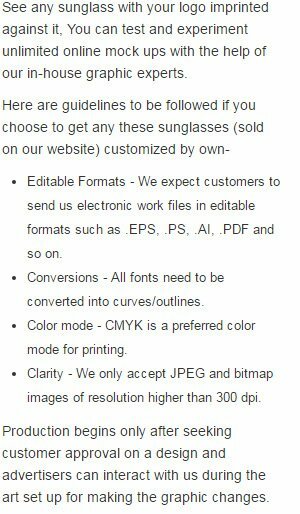 Request a quote to know about those price benefits that you can avail on bulk orders of glitter sunglasses. Imprint area - 2" x 3/16"
Imprint Area : 2" x 3/16"